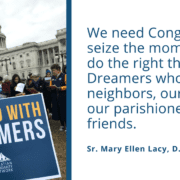 WASHINGTON, D.C. – In recognition of World Refugee Day, Jesuit Refugee Service/USA (JRS/USA) and 13 U.S.-based Jesuit law schools announce the release of A Fair Chance for Due Process: Challenges in Legal Protection for Central American Asylum Seekers and Other Vulnerable Migrants. This report captures efforts by Jesuit law schools to assist asylum seekers and migrants from Central America and challenges they face in delivering these services. Participating law schools are: Boston College, Creighton University, Fordham University, Georgetown University, Gonzaga University, Loyola University Chicago (in close collaboration with the Center for the Human Rights of Children housed at Loyola University Chicago), Loyola Marymount University, Loyola University New Orleans, Saint Louis University (in close collaboration with the Catholic Legal Assistance Ministry housed at Saint Louis University), Santa Clara University, Seattle University, University of Detroit Mercy, and University of San Francisco. In the summer of 2014, the number of Central Americans migrating to the United States reached peak numbers. Of particular concern was the high number of unaccompanied and separated migrant children, originating primarily from the Northern Triangle of Central America – Honduras, El Salvador and Guatemala. In April 2015, JRS/USA, a nongovernmental organization working to advance the rights of refugees and displaced persons around the world — and Jesuit law schools launched a partnership to raise awareness about the plight of children and families from Central America seeking protection in the U.S. “This partnership is a ground-breaking effort among Jesuit institutions rooted in the Catholic tradition of welcoming the stranger, to identify and call for significant changes in U.S. policies and practices toward migrants,” said Armando Borja, JRS/USA National Director. Individuals served by Jesuit law schools cited a variety of reasons for fleeing their home countries, including violence suffered at the hands of gangs and criminal actors, and violence suffered in the home. For Arturo, a 19-year-old from Honduras, escaping north was an escape from intense domestic violence. His father abandoned his family and left him with his uncles who would beat him and chain him to the inside of their truck during the day to prevent his escape — eventually he was able to flee to the U.S. to reunite with his mother and sister. Finding legal representation is one of the first hurdles that migrants arriving in the U.S. face. According to data compiled by the Transactional Records Access Clearinghouse at Syracuse University, only 46% of the unaccompanied children going before Immigration Court are currently represented by an attorney — and more than 81,000 juveniles are still without legal representation. Jesuit law schools are working to fill this void, serving asylum seekers and other vulnerable migrants from Central America in a variety of ways, including through research, training and direct representation. In 2014, Jesuit law schools represented 291 asylum seekers and migrants from Central America and anticipate serving more than 300 in 2015. Procedural challenges in managing the mandated expedited docket for these migrants. Legal challenges posed by limitations in the acceptance of gang-related violence claims. Logistical challenges related to consistent and reliable access to clients and courts. Challenges accessing counseling and support services. Jesuit Refugee Service/USA is an international Catholic non-governmental organization whose mission is to serve, accompany, and defend the rights of refugees and forcibly displaced persons. Be Part of DREAM Sabbath 2011!